Week 1 was a success. It was a super simple project, one I'd happily recommend to any beginner. It took maybe 20 minutes total. I think I might still add some cute buttons below the shoulder ties, but I'll have to wait until I have a Joann's coupon. 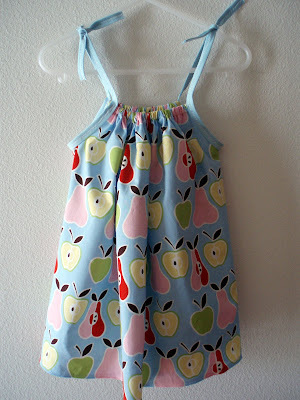 And yep, that's nearly the last of my Alexander Henry apples and pears fabric. I have just enough left to make a matching dress for Margaret's doll. 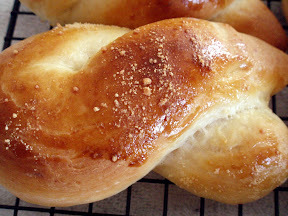 This is one of the easiest bread recipes I've ever followed. I even mixed up a few batches of the dry ingredients and stored them in jars so I can make more of this bread on a whim. 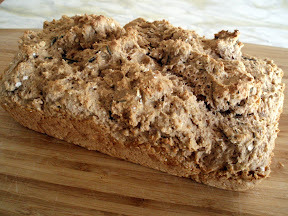 I added a bit of flax seed for the health factor and sprinkled fresh rosemary on top before baking for flavor. It's a nice, rustic sort of bread. We ate it with honey, with jam, with cold cuts and mustard, and on its own. Easy, versatile, tasty. That's a winner in my book. 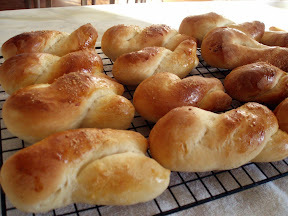 These were more labor-intensive than the quick bread, but not painfully so. I added a little garlic powder with the Parmesan on top, because we're a house full of garlic fiends. Margaret, Fritz, and I ate about 10 of them between the three of us on this first night I served them. These were the least fun to make. As I was rolling them out, preparing to toss them on the griddle, I mentally crossed them off my repeat list. Then I tasted them. Wow. Better than any store-bought tortilla I've ever had. I guess we'll file that recipe away in the "when I've got the energy to bother" file. Whew, on to week two! 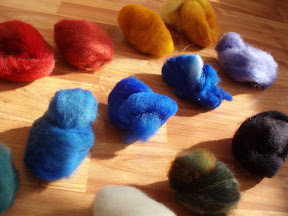 Oh, and I decided to give needle felting a shot. 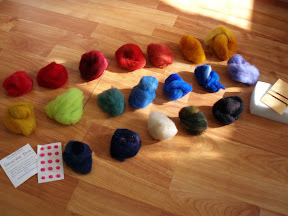 I bought a kit from Decadent Fibers, and it just came today. 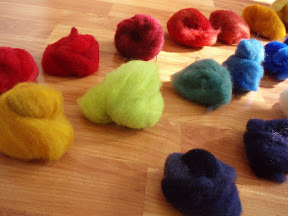 They included far more than the promised 10 balls of roving, and in such pretty colors. I can't wait to get started! Wow, busy lady, good for you! I have an apron out of that fabric that my mom made for me! Too cute!